One of the most family-friendly activities in the Mat-Su Valley is the Reindeer Farm, located just outside Palmer on Bodenburg Butte Road. 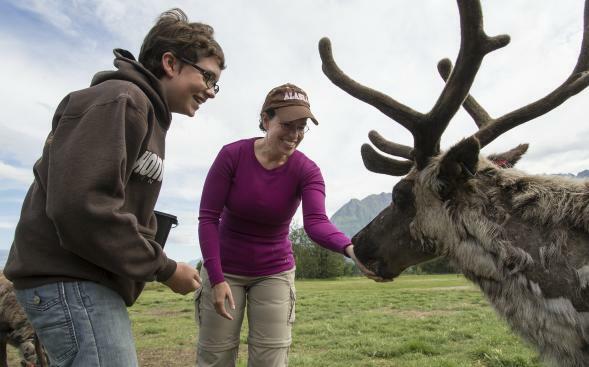 Throughout the summer, thousands of people visit the farm to see the reindeer and elk. Even though the farm closed for the season, there&apos;s still one last chance to enjoy it - this weekend is the final weekend for the Reindeer Farm Fall Fun Day. Each Saturday in October, the farm opens from 10 a.m. to 6 p.m. for an entire days&apos; worth of activities. This year, there is a reindeer tour, a giant hay maze, wagon rides, pony rides and even a potato launching contest. It&apos;s a great way to spend an afternoon under the watchful ridge of Pioneer Peak. There are events for the entire family - from young to old. Admission is $10/person. Owner Denise Hardy said she&apos;s even got a pumpkin patch set up - with a catch. Because the farm doesn&apos;t exactly grow the pumpkins throughout the year leading into the fall harvest, the pumpkins come from a local grocery store, but are set up throughout the patch for people to purchase, like a "traditional Lower 48 pumpkin patch," Hardy said recently. This Saturday, special guest Adele Morgan will also be at the Reindeer Farm. Morgan is from Wasilla and is a well-known singer/songwriter who has performed all around Alaska. Also this weekend, the hay maze gets transformed into a "Zombie Hay Maze" that is sure to scare your socks off. The event is a fund-raiser for the Palmer High School music program. It&apos;s open from 7:30 p.m. to 10:30 p.m. this Friday and Saturday, and again on Oct. 30 and Oct. 31. It is recommended only for kids ages 10 and up because of the scary nature of it. Check out www.reindeerfarm.com for more information about the zombie maze and fall fun day. Grab the family and head to the Reindeer Farm this Saturday!